Yes I DO look like Luanne! Click for proof. | House Unseen. Life Unscripted. Cari and all others: your argument is invalid! Um... I kind of like it. I don't think it looks like Luanne. Frankly, it frames your face nicely and a little bit of height is good for people with squared off jaws. It keeps your face from looking too short. BTW... I don't think your face is totally square shaped, just that you have a lovely defined jawline. I agree with Charlotte. You look adorable and lovely. All I can say is that if I could be guaranteed a result even half as nice as yours I would have cut my own hair a long time ago! 1. I have no idea who Luanne is. 2. Your new haircut is darling. 3. The bigger the hair, the closer to God. Hahaha! I've never heard that one before, Paula. Too funny! It does look like Luanne!!! But it is also very pretty - I really dig the layers! You dun good!!! You did that yourself?? You do a better job than the new hairdresser I tried months ago! Wha....??? It's like the top half of an Elvira costume! Woman, you need to give yourself a break. I would love to cut my own hair, and would do it gladly if I could get results like that. The hairdresser I PAY can't do so well. 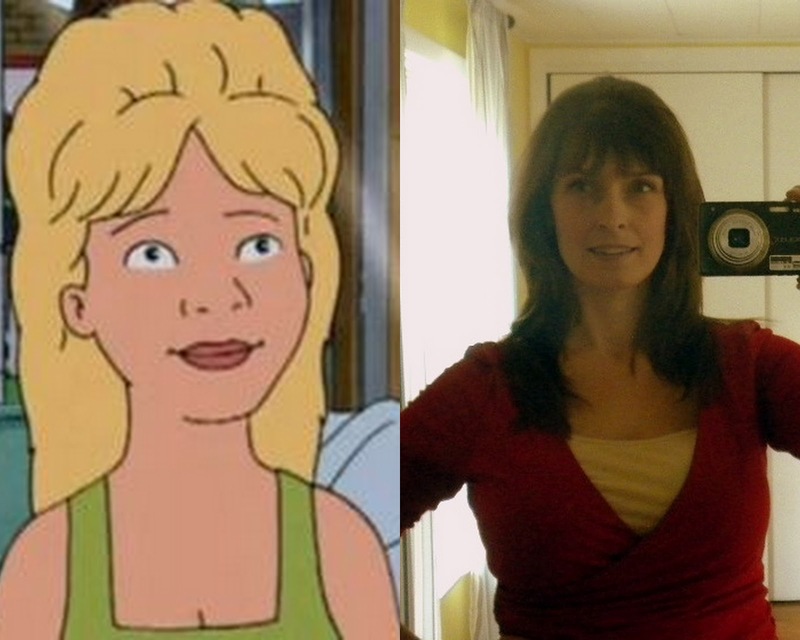 And no, you don't look like Luanne (dang, now I have the word propane stuck in my head). She'd be lucky to look like you! Three words: You do not. I like it! It suits you. Makes your eyes all poppy and mysterious. I love it - the bangs look awesome! Honestly. Would you listen to them? ^^^^ Those people up there! They're right. Oh come now! You could put poop on your head and still look pretty. Oh man, I almost had an accident. That's the haircut of a woman who doesn't take any sass. Awesome. In fact, she just GIVES sass. Sassy. She's a sassy sass girl! I love the look! You are beautiful! No, you so do not look like Luanne. You look like my mom, circa 1995. And that's a compliment. My mom is gorgeous and has great hair. As far as "big hair" goes, do you not remember the 80's?! And the HAIR? Your hair isn't even poofy. My hair is much bigger, and it isn't even layered or anything. It's just naturally ... fluffy. I was born too late. It would have been so cool in the 80's. I wish I could cut my hair and have it look that good. You will have to explain how you did the back. I cut my hair a couple of weeks ago -- just to even out the ends -- and had to hang my head in shame and get my husband to fix it for me. So I lost like four inches just trying to even the ends. Ok, so if you're looking for confirmation that you look like Luanne, then here it is. YES, you do!!! IF 1) you bleach you hair yellow, 2) somehow become animated, wait, you are pretty animated in real life. Hm, forget #2. 3)Purchase some stock in Aqua Net. (do they still make that? It was a pivotal part of my mornings growing up in Texas) 4) Ok, I don't have a #4. Ok, you do look like Luanne. I think that's what I'll call you from now on. Do you think your family will mind? The main question on my mind is: what sweet haircut is next? The Dorothy Hamill was big back in the 80's...although, could that be done in a residential bathroom? Honestly, Luanne or not, it looks great! Great job! You wanna give me a haircut sometime? I think you're qualified!